I am reminded anew that when we rest in God's promises, we can find much contentment, peace and joy in Him, irrespective of our outward circumstances, physical infirmities or inner struggles. God's presence and His Words can calm any storms in our life and give us hope to face uncertain tomorrows. We serve such a great God! How I need to remember that! Sometimes, difficult circumstances, stressful situations, physical or mental strain, caused me to forget to cling on to God's promises. I may know God's Words and great doctrine in my mind, but I forgot to apply it to the particular situations in my life or forgot to keep hanging on to God's promises. It seems to be a moment by moment cling to God and His Words, and living by faith from moment to moment. Not just applying God's Words today or to a particular situation yesterday, but every day and to every situation. And it is only possible by God's enablement. That's why prayers and God's Words are important to me. In my own strength I am not able to face each day. But in God's strength, I am more than conquerors through Him Who loved us. I am weak but He is strong, and His strength is made perfect in my weaknesses. He gives me the strength and grace to live for Him each day. Whatever our needs are for the moments, the answer is to be found in the Bible, if we take time to search for it. Whatever we are feeling, whatever we are suffering, whatever we are hoping, the Bible has something to say. Thank God for guiding us, comforting us and strengthening us through His Words and promises. The only time when I can't enjoy prayers or reading of God's Words is when I am severely depressed. At such time what I experienced is called clinical depression. It is not just feeling down for a few days and then get better. It usually lasted 3 to 6 months or longer. I have had such experience some 11 times over the last 20 years. During such time the chemical in my brain was not functioning properly and I can't think or feel aright. At such time, what I found to be most painful was I can't find any comfort in God's Words or know His presence though He is with me. Thank God for sustaining and restoring me. Thankfully after my diagnosis of proneness to bipolar disorder (manic-depressive illness) last year, I know that this is a medical condition that can be treated. With medical help, I am experiencing relieve from severe depression by it being shortened and I am lifted up to a level that I can function and benefit from God's Words and other helps. I am learning now to manage my condition so that my down time can either be prevented or shortened, and I can live a more stable life and be useful for the Lord. Thank God for His many wonderful promises in His Words. 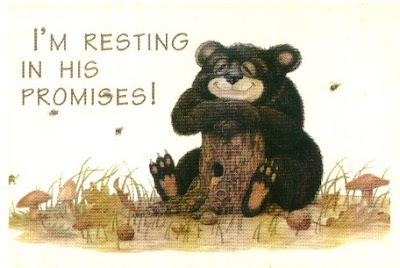 May God enable us to rest in His wonderful promises and enjoy His peace which passeth all understanding, and joy to walk with Him and serve Him, no matter what we have to go through. He is with us and will never leave us nor forsake us. His grace is sufficient for us and we can do all things through Him who strengtheneth us. How about you? Which among God's many wonderful promises in His Words is/are most precious to you? I'm so pleased that you're getting so much support for your blog. Isn't that the nicest feeling? Also, I hope you're feeling better!